DRONE VIDEO IN ''VIDEOS!'' 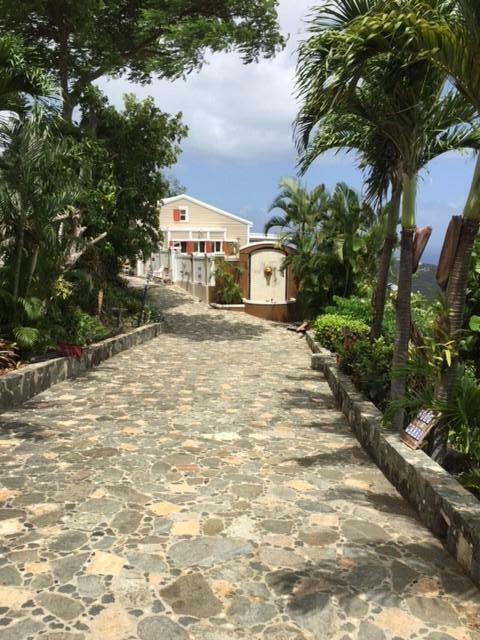 Gated, paved rock-slab driveway, orchids and fruit trees abound, plenty of room to build another dwelling. Large outdoor area designed for entertaining. Magens Bay view from patio. Place for your pets. Stainless Steel appliances, gas/electric Thermador stove, Kitchen Aid Stove hood, Pot Filler, GE Monogram Refrig./Freezer, Kitchen Aid dishwasher. House was expanded in 1996-1997 by the Architect/Owner. WELL DONE!!! Directions: UP Magens Bay Estate road, on right to property ID mounted on column at gate; DOWN Magens Bay Estate road, on left to property ID mounted on column at gate.